I'm glad to finally present this horse to all who ever loved my last. It's been over a year since I posted anything, and a lot of my horse projects where lost between then and now. The reason - I needed a horse like this one to work from. 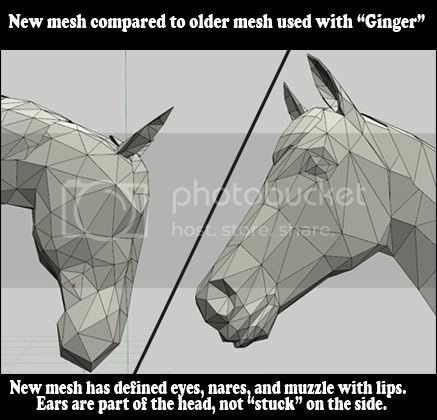 I realized early on how not having a base to work from added extra complications to my horse meshing. I started from ginger, but each time, I had to correct the symmetry, reposition and rotate her head, all just to have a decent starting point. I desired a base, a horse that I could use each time, with perfect symmetry in face and vertex alignment, and in a basic pose ideal for use as a starting point for any position imaginable; simple enough to be molded in to any breed, but detailed enough to function alone as a download. That is what I visioned - and in January, I finally dropped all my other projects just to start work on this "basic horse"
I'm glad it's finally finished, and proud of how it turned out. I want to point out the improvements this new mesh has over my earlier meshes. I’ve managed to sculpt a more detailed form all the while keeping the poly count in a reasonable range. Both the mane and tail use alpha layers for better realism. Along with the basic pose are 10 additional poses, each "pasture perfect" for ideal realism on your Sims farm, or in the stable. 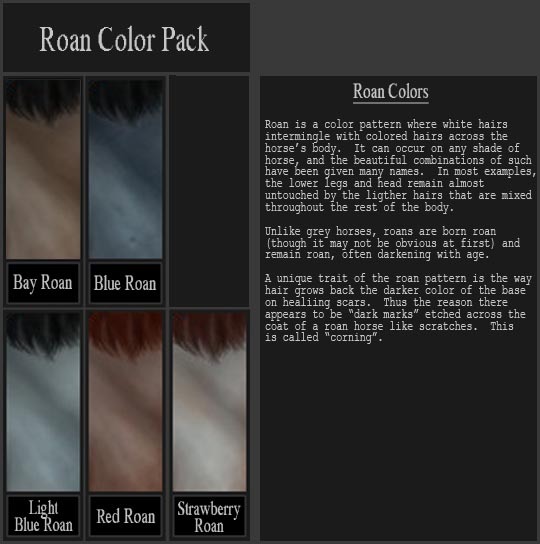 There are 50 recolor’s total, (49 recolor files) arranged in to separate packs for download convenience. Each pose is a slave mesh to the main one, and therefore uses the same textures. No, they do not move. They are not real horses… though I would love to learn how to “make them come alive”, or even make them ridable…I don’t know enough about modding at this point to even know where to begin…however, it is possible. So what use do they have? Decoration or props for stories. If you have open for business, you can run a horse farm and sell them. Sorry it is not much, but it is better than nothing, and I hope you all will enjoy them just the same. 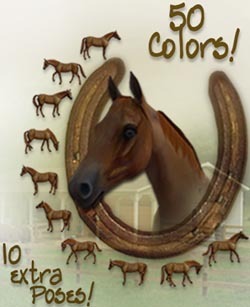 I love horse colors, and have done a lot of independent research on the genetics behind them over the past few years. I incorporated what I knew in to these downloads. 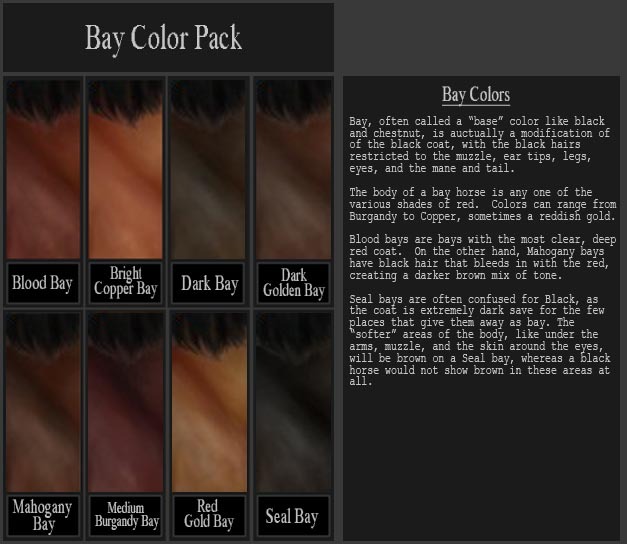 Along with each pack is a picture showing the colors inside and a short explanation on the color type. I thought some of you might find this bit of information interesting. 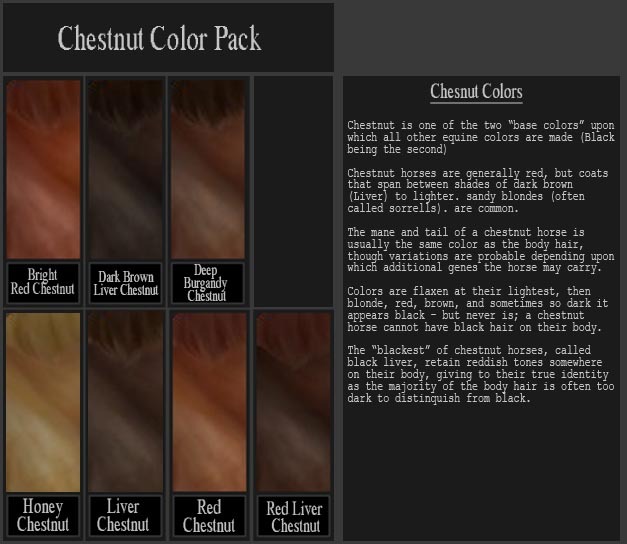 ^_~ These “info sheets” are also attached to this thread, seen below, so you don’t have to download to see them. Feel free to pm me with any questions, but please read this whole thread to make sure the question isn’t anwered already. Chances are, it is. But I will post a list of common questions received here in case you overlooked the answer. If you still need to contact me, do so through pm… I don’t check my e-mail as often as I used to, and my spam blocker is set very high… you might not be able to get through to me anyways. Q. 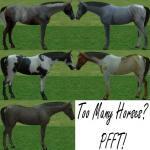 Do the horses move / do you need to feed them / can sims ride them? Q. They aren’t showing up in my game / how do I download? Q. I don’t have winrar, can you change it to winzip? A. I prefer winrar, and content guidelines require than I only upload one or the other. Many downloads on MTS are in .rar format. My advice is to go ahead and download it now so you won’t run in to this problem later on. It’s free, and I posted the link in the section below. Q. How do you make horses? A. Wow, what a detailed answer this would require. If you think it’s as easy as your question seems to imply… you probably wouldn’t want to hear my explanation… I haven’t written any tutorials for it, and I don’t intend to just to answer this ^_~ I will reccomend the creation section of this site, it’s full of many helpful tutorials and if you honestly want to learn, and are prepared to do whatever it takes, read whatever it takes, then you’ll find the best help there. Good Luck! Q. Where did you get that *object name* from? - Each mesh has a 2064 face count, and 1250 vertex count. - do not upload recolors as a pay item on any site. I do not agree with the “pay site trend” that has taken over the community since the days of the Sims 1, and do not wish to be a part of it in any way, even indirectly. Anything related to this horse should be kept free, so everyone can enjoy it. - Though I don’t mind if they are included in lot uploads (as long as they aren’t uploaded to the exhange). 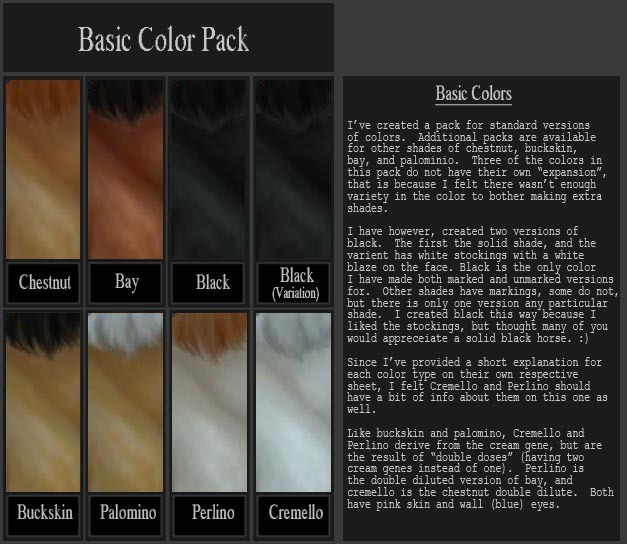 I do ask that you link back here, so that anyone who is interested may know where to get the entire set of poses and colors from. - Meshed with Wings, mapped with Wings and UV Mapper Classic, packaged by Sim PE. These are all free programs. I’d like to also thank Numenor for helping me set the mane and tail as a slave subset. - I take requests as a suggestion, if there’s something you want to me to make, I will consider the idea…but don’t hold me to it. Even if I do eventually make it, it may not be released till months after you ask, as if often takes that long or more to make something from start to finish…depending on my current agenda, and the complexities involved in what I’m making. -More colors – 50 was my goal for this upload, but there are many I haven’t represented. 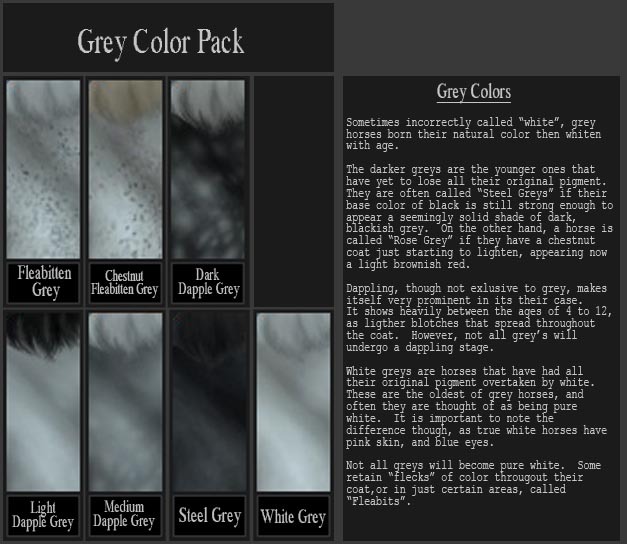 Silver Dapples, Champagnes, and more shades of the colors already created, just to add to the variety. 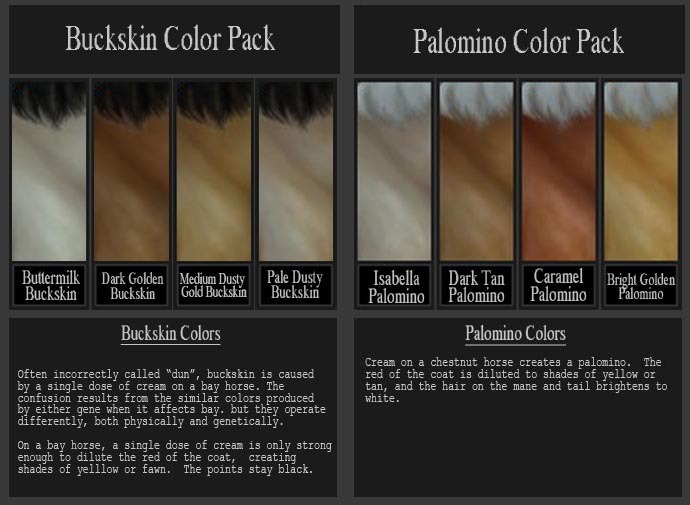 I also Intend to make appaloosa and paint patterns. The reason I didn’t include them with this upload is because of the sheer vastness all the color/pattern possibilites would span. The outcomes of which are extensive enough to stand alone as a separate download. If you have a color you’d like to see, let me know about it… And if there’s are particular shade, provide a picture. The only color group I plan NOT to make at this point is brindles. They are far too unusual a color to throw in with the rest like they appear everyday…not to mention, they’d be very difficult to create. Perhaps someone else would be willing to give it a try? -More positions – Like I already said, these positions are meant for a pasture or stable setting… that’s the reason they appear so calm and docile. I do plan to make more energetic poses, like rearing, galloping, etc. -Saddled poses – I have a saddle in the works, with it’s release, I’ll include under tack poses as well, such as trotting, cantering, walking, etc. As for the horse being ridable, that’s a goal of mine as well, but I’m afraid I’m lost unless I have some outside help. Nether the less, I intend to learn what I can about making such things possible. -Foal – You may have seen a preview of the “basic foal” above. This foal uses the same recolors as the adult. I plan to release it with it’s own set of poses though, so I’ll have to finish them before it’s ready. Each mesh has a 2064 face count, and 1250 vertex count. Meshed with Wings, mapped with Wings and UV Mapper Classic, packaged by Sim PE. These are all free programs. I’d like to also thank Numenor for helping me set the mane and tail as a slave subset. 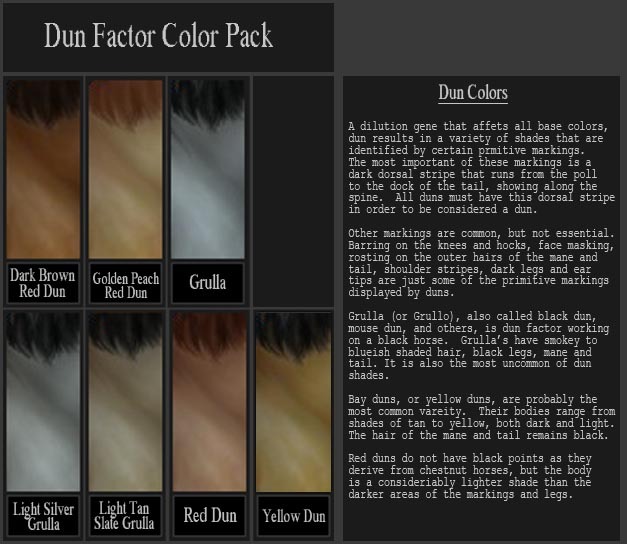 These recolours may or may not be endorsed by Dragon Slave.